Industrial Engineering, Sabanci University, Istanbul, Turkey. Industrial Engineering – Industrial Engineering, Department of Industrial and Mechanical Eng. Qazvin Islamic Azad University, Qazvin, Iran. Ranked 2nd among M.Sc. Students. Industrial Engineering – System Analysis, Department of Industrial Eng. Abhar Islamic Azad University, Abhar, Iran. Ranked 2nd among B.Sc. Students. Certificate of Outstanding Contribution in Reviewing, ELSEVIER – International Journal of Electrical Power and Energy Systems, 2018. Certificate of Outstanding Contribution in Reviewing, ELSEVIER – Expert Systems and Applications, 2018. Certificate of Outstanding Contribution in Reviewing, ELSEVIER – Applied Soft Computing Journal, 2016. 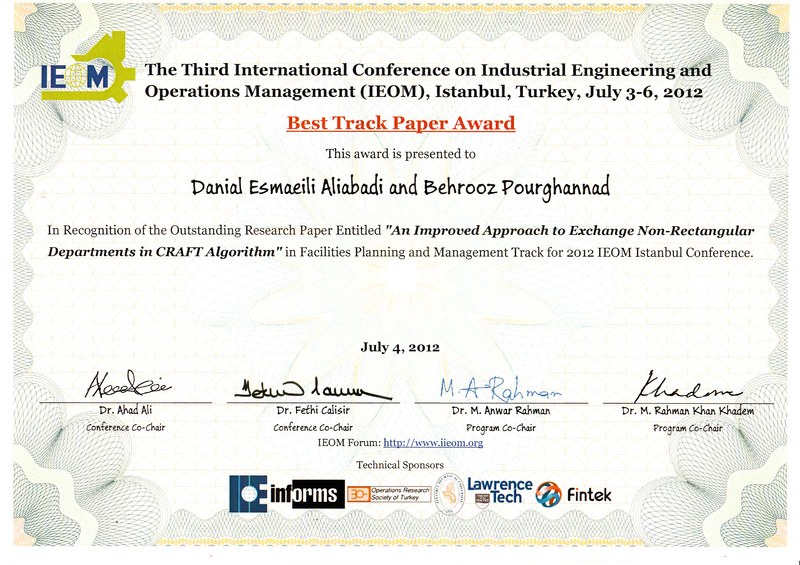 Best Paper Award in Facility Planning and Management Track, IEOM 2012. 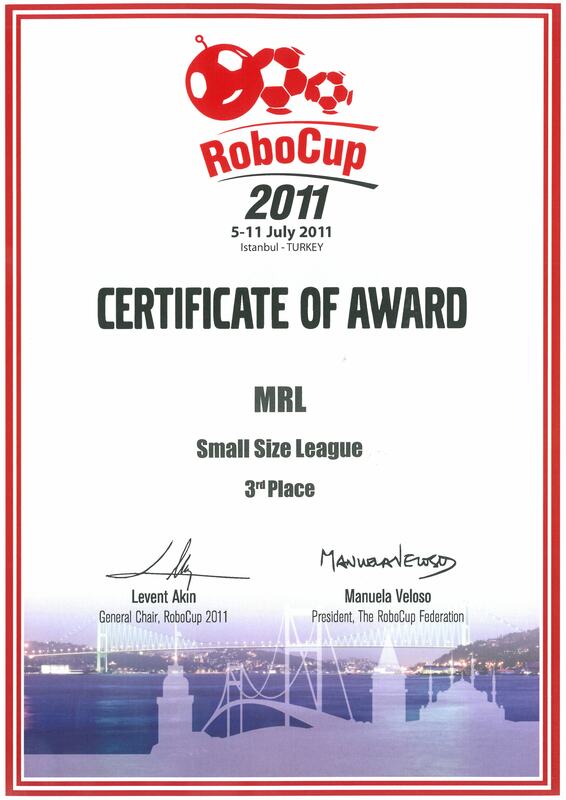 Third place at International Robocup competitions, Turkey, 2011. 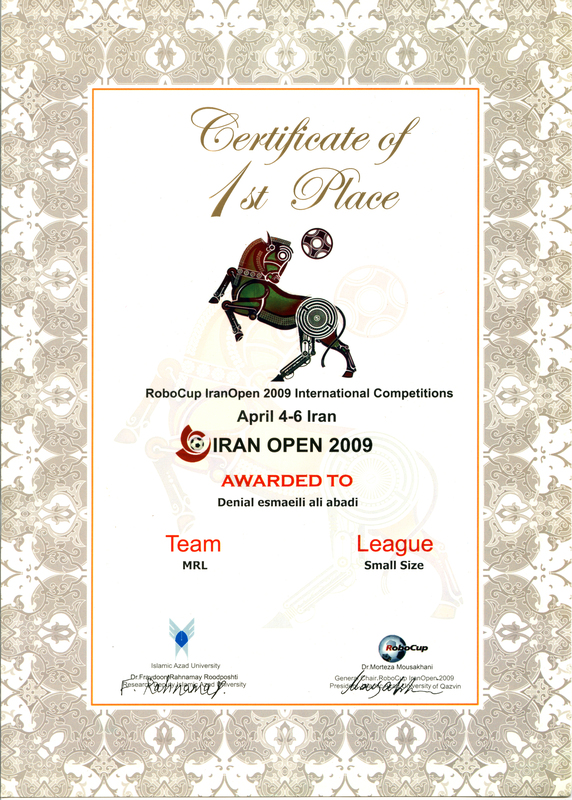 Second place at 6th International Iran Open Robocup competition – small size league. First place at 11th National Robocup Khwarizmi festival – small size league. 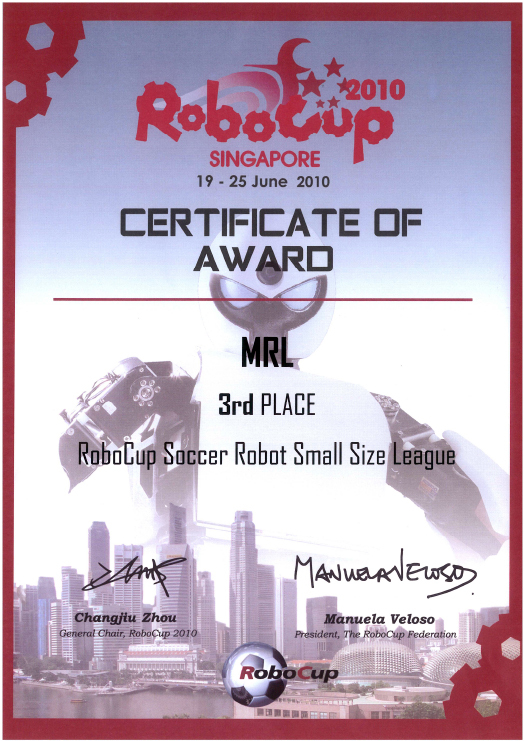 Third place at International Robocup Competitions, Singapore, 2010. 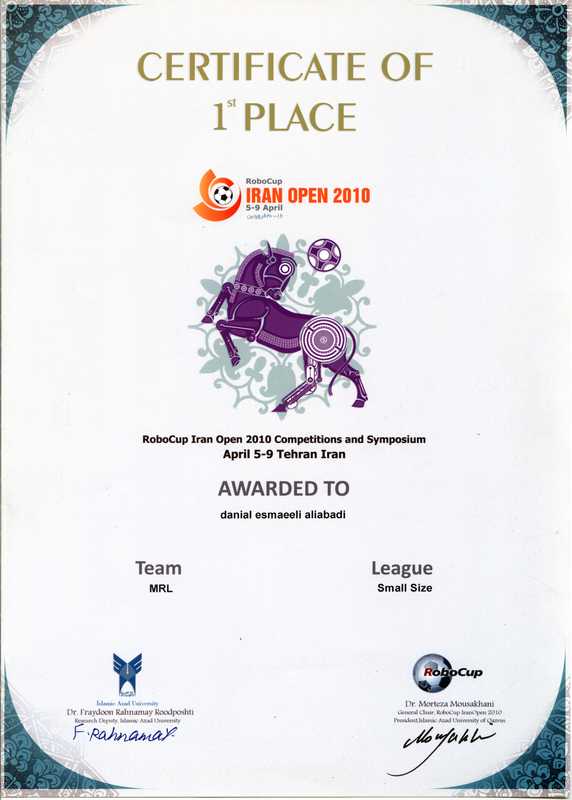 First place at 5th International Iran Open Robocup competition – small size league. 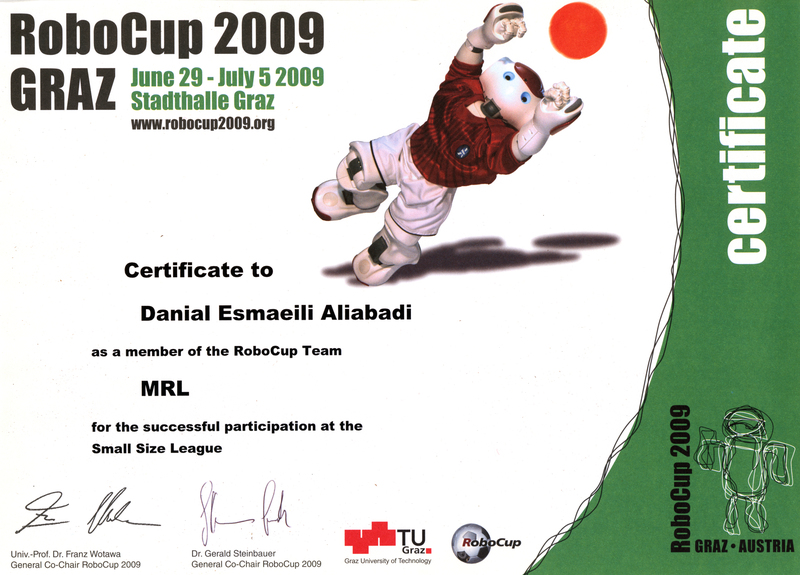 Participating in International Robocup Competitions, Austria, 2009. First place at 4th International Iran Open Robocup competition – small size league. Third place at 5th National Khwarizmi youth festival – Programming Branch. 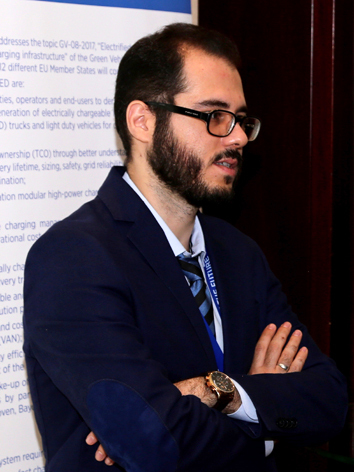 4th place at 4th National youth Khwarizmi festival – Mathematics Branch.
. Danial Esmaeili Aliabadi, Abolfazl Kazemi, Modeling integrated multi-item supplier selection with shipping frequencies, Optimization in Industrial Engineering, 2015, 8(18), 71-78.
. Hassan Haleh, Danial Esmaeili Aliabadi, Improvement of imperialist colony algorithm by the employment of imperialist learning Operator and implementing in travel salesman problem, Journal of Development and Evolution of Management, 2015, 22, 55-61.
. Bihter Avşar, Danial Esmaeili Aliabadi, Reza Yousefnezhad, Edris Esmaeili Aliabadi, OP-01 Academic Presenter: a new storytelling presentation software for academic purposes, Turkish Journal of Biochemistry, 2018, 43(s4), 18–18 (SCI).
. Bihter Avşar, Danial Esmaeili Aliabadi, Edris Esmaeili Aliabadi, Reza Yousefnezhad, Academic Presenter: a new storytelling presentation software for academic purposes, arXiv preprint arXiv:1607.06979, 2016 Jul 23, 1-9.
. Shalima Shawuti Can, Carmine Difiglio, Danial Esmaeili, Mehmet Ali Gülgün, Çınar Öncel, Serhat Yesilyurt, Using Natural Gas as an Environmentally Sustainable Power Source with Solid Oxide Fuel Cells, IICEC Energy and Climate Research Paper, May 2018.
. Danial Esmaeili Aliabadi, Murat Kaya, Güvenç Şahin, An Investigation on the Strategic Bidding Behavior of Power Generation Companies under Various Risk Indices, (in preparation).
. Bihter Avşar, Danial Esmaeili Aliabadi, Edris Esmaeili Aliabadi, TSP Solver: An Integrated Framework for Solving Traveling Salesman Problems Consistent with TSPLIB, Fuzzy Systems and Data Mining III (series: Frontiers in Artificial Intelligence and Applications), Antonio J. Tallón-Ballesteros, Kaicheng Li (eds. ), Amsterdam, Netherlands: IOS Press 2017, 70-78.
. Bihter Avşar, Danial Esmaeili Aliabadi, Edris Esmaeili Aliabadi, Reza Yousefnezhad, Academic Presenter: a new storytelling presentation software for academic purposes, FEBS Workshop on Molecular Life Sciences: Training Tomorrow’s Scientists, Izmir, 5-7 September, 2018.
. Danial Esmaeili Aliabadi, Carbon Capture, Utilization, and Storage in the Context of Turkish Energy Market, 29th European Conference on Operational Research, Valencia, 8-11 July, 2018.
. Danial Esmaeili Aliabadi, Murat Kaya, Güvenç Şahin, Competition, Risk and Learning in Electricity Markets, 13th Balkan Conference on Operational Research, Belgrade, 25-28 May 2018.
. Bihter Avşar, Danial Esmaeili Aliabadi, Edris Esmaeili Aliabadi, TSP Solver: An Integrated Framework for Solving Traveling Salesman Problems Consistent with TSPLIB, The 3rd International Conference on Fuzzy Systems and Data Mining (FSDM2017), Taiwan, 24-27 November, 2017.
. Danial Esmaeili Aliabadi, Murat Kaya, Güvenç Şahin, An Investigation on Behavior of Power Generation Companies in the Electricity Market under Different Market-Clearing Mechanisms, 28th European Conference on Operational Research, Poznań, 3-7 July, 2016.
. Danial Esmaeili Aliabadi, Güvenç Şahin, Murat Kaya, Determining Collusion Opportunities in Deregulated Electricity Markets, International Conference on Operations Research (OR2015), Vienna, 1-5 September, 2015.
. Danial Esmaeili Aliabadi, Murat Kaya, Güvenç Şahin, An Investigation on Behavior of Power Generation Companies in the Electricity Market with Different Clearing Strategies, International Conference on Energy and Management, Istanbul, 30 May, 2014.
. Maziar Ahmad Sharbafi, Ali Azidehak, Mohammad Hoshyari, Omid Bakhshandeh Babarsad, Aras Adhami-Mirhosseini, Alireza Zareian, Danial Esmaeili Aliabadi, Amin Ganjali, Saeed Esmaeel pourfard, Sajjad Ziadloo, Hamidreza Jamaati Tafti, MRL Extended Team Description 2011, International Robocup 2011, Turkey, 5-11 July, 2011.
. Maziar Ahmad Sharbafi, Mohammad Hoshyari, Saeed Esmaeel pourfard, Omid Bakhshande Babersad, Mohammad Haaj seyed javadi, Danial Esmaeili Aliabadi, MRL Team Description 2010, International Robocup 2010, Singapore, 19-25 June, 2010.
. Danial Esmaeili Aliabadi, S.Ehsan Shojaie, A new approach for solving risk problems, International conferences of project management, Tehran, Iran, 4-5 April, 2007. 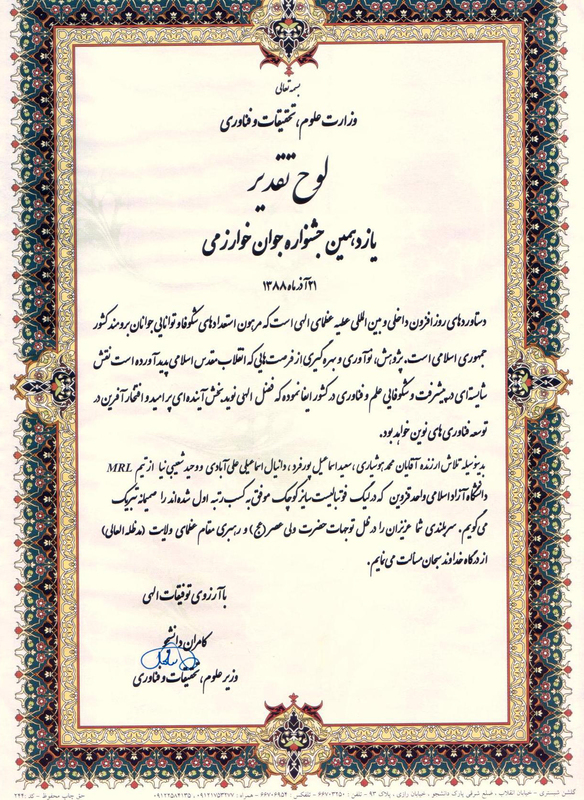 Reza Yousefnezhad, Danial Esmaeili Aliabadi and Edris Esmaeili Aliabadi, “An Intelligent Mathematical Software named Ostad”, Iran Patent Office, Registration Number: 102589. Using Reinforcement Learning theory to facilitate decision making process. Mechatronics Research Laboratory (MRL), [2008-2011] . Founder of Gohar Arya Khazar Company, [2007-Present] .